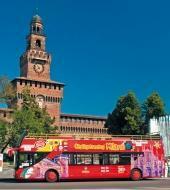 Discover Milan and all the wonderful highlights with the Hop on Hop off Bus! City Sightseeing Milan, with its panoramic open-top double-decker red buses, offers you the opportunity to discover this busy and attractive city from a height. With three lines, running 7 days a week all year round, City Sightseeing Milan is the best way to discover the city for those who have only a few hours to spare. Commentary for kids in Italian, English or Spanish. * During matches and events stops 9, 10 and 11 are suspended. Click here for the map of the tour and the timetable.